Add almonds to a food processor with a metal blade. Pulse until they finely ground. Add in powdered sugar and butter. Pulse 3-4 times then add the flour vanilla, almond extract, and salt. Run the food processor until the ingredients turn into a dough like mixture. Wrap the dough in plastic wrap and place in refrigerator for 3 hours. 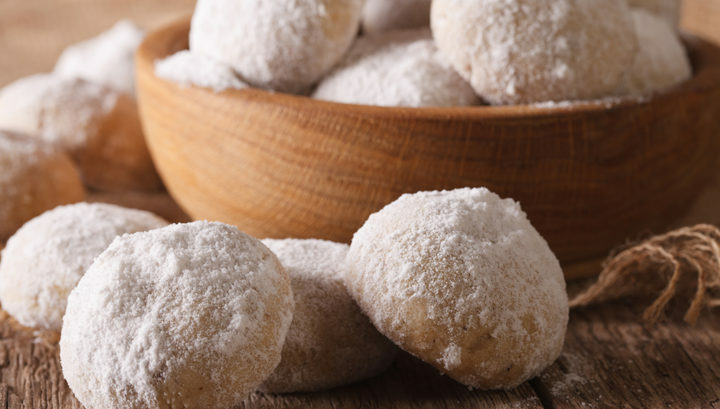 Place the 2 ½ cups of powdered sugar in a large bowl and set aside. Roll dough into 1" balls and place them about an inch apart on the baking sheets. Bake 12 to 15 minutes until they are a pale golden color. Put the hot cookies directly into the powdered sugar. Roll them to cover completely with sugar. Set aside to cool completely. After the cookies are completely cooled, roll them once more in the powdered sugar.